Get the most accurate measurements when cooking and baking with our durable and high-quality measuring cups and spoons. These essential kitchen hand tools allow you to read the accurate measurements of dry or liquid ingredients before adding them to a recipe. 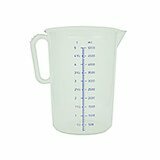 You can choose among the virtually unbreakable polycarbonate or high-quality polypropylene measuring cups available in a range of sizes. The rugged polycarbonate construction keeps them unaffected by food acids. 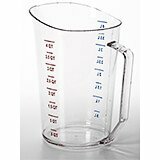 All the clear cups available in this section are marked for ounces, pints, quarts, or liters to ensure a right measurement. Made of rust and stain resistant stainless steel, our commercial measuring spoons enable to measure the exact amounts of ingredients. 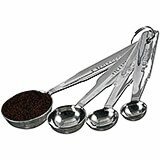 All Stainless Steel Coffee Measuring Scoop, 7.88"
The Paderno World Cuisine 7 7/8" long coffee measuring scoop has a stainless steel handle. It is dishwasher safe and extremely durable. It has a loop at the end for easy hanging. It is a staple in any coffee house or cafe, as well as at home. 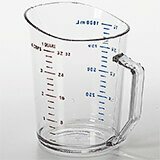 Whether the recipe calls for ounces, pints, quarts or liters, Camwear Measuring Cups make the right measurement clear. These graduations are molded-in and imprinted in blue on one side for metric and red on the other for American standard. Made of rugged polycarbonate, they are not affected by food acids. They won't dent, ensuring an accurate measurement. The handle is molded to the cup so it won't break off. 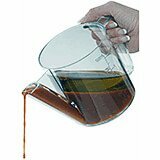 This fat separator can also be used as a gravy separator. Jug to separate fat from juices by decanting. The pouring spout from the base of the measuring cup enables the juices to be collected. San graduated. Dishwasher safe. Measurements: 4 3/4" Diam. 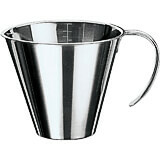 9" X 3" X 12"
This 3-3/8-Ounce stainless-steel stackable measuring jug is spouted for easy pouring. It allows for quick measuring and dispensing liquid ingredients. 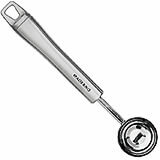 Material: Stainless Steel.Capacity: 0.11 Qt. 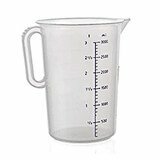 This Paderno world cuisine 4" diameter stackable stainless steel measuring jug is a staple in any kitchen. It is spouted and allows for quick measuring and dispensing of liquid ingredients. Material: Stainless Steel.Capacity: 0.31 Qt. 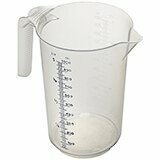 4.5" X 4.5" X 4.38"
This Paderno world cuisine 4-1/2" diameter stackable stainless steel measuring jug is a staple in any kitchen. It is spouted and allows for quick measuring and dispensing of liquid ingredients. Material: Stainless Steel.Capacity: 0.5 Qt. 5.88" X 5.88" X 5.12"
This Paderno world cuisine 5-7/8" diameter stackable stainless steel measuring jug is a staple in any kitchen. It is spouted and allows for quick measuring and dispensing of liquid ingredients. Material: Stainless Steel.Capacity: 1 Qt. 6.12" X 6.12" X 5.88"
This Paderno world cuisine 6 1/8" diameter stackable stainless steel measuring jug is a staple in any kitchen. It is spouted and allows for quick measuring and dispensing of liquid ingredients. Material: Stainless Steel.Capacity: 1.5 Qt. 6.62" X 6.62" X 7.5"
This Paderno world cuisine 6-5/8" diameter stackable stainless steel measuring jug is a staple in any kitchen. It is spouted and allows for quick measuring and dispensing of liquid ingredients. Material: Stainless Steel.Capacity: 2.13 Qt. 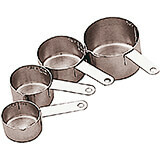 Measuring spoon set of 4. Made of stainless steel. Practical for a rapid measuring. 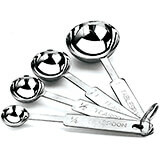 Set includes 4 sizes of spoons: 1/5 Teaspoon 1/16" Diam. 2/5 teaspoon 1" Diam. 1 Teaspoon 1-1/5" Diam. 1 Tablespoon 1-1/2" Diam. Weight: 4 oz. 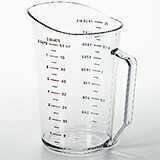 Translucent, Polypropylene Measuring Cup / Pitcher, 5.28 Qt. Graduated Pitcher. With spout and handle, made of translucent polypropylene, graduated in 1/10 liter. Dishwasher and Microwave safe. Measurements: 10 1/2" H. Capacity: Liter 5. Weight: 4 oz. 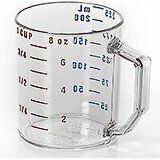 Translucent, Polypropylene Measuring Cup, 1.05 Qt. Graduated Pitcher. With spout and handle, made of translucent polypropylene, graduated in 1/10 liter. Dishwasher and Microwave safe. Measurements: 6 1/2" H. Capacity: Liter 1. Weight: 4 oz. 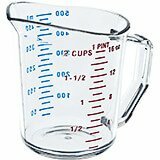 Translucent, Polypropylene Measuring Cup, 3.17 Qt. Graduated Pitcher. With spout and handle, made of translucent polypropylene, graduated in 1/10 liter. Dishwasher and Microwave safe. Measurements: 9 1/4" H. Capacity: Liter 3. Weight: 4 oz.